“La Victoire’ is a dialogue with Yves Klein’s sculpture ‘La Victoire de Samothrace”, which was itself inspired by The Winged Victory of Samothrace, also called the Nike of Samothrace, a 2nd century BC marble sculpture of the Greek Goddess Nike (Victory) – Since 1884, it has been prominently displayed at the Louvre and is one of the most celebrated sculptures in the world. ‘La Victoire” is a social comment on modern world’s spreading fear of splitting apart and its solution: optimism, elevation, togetherness. 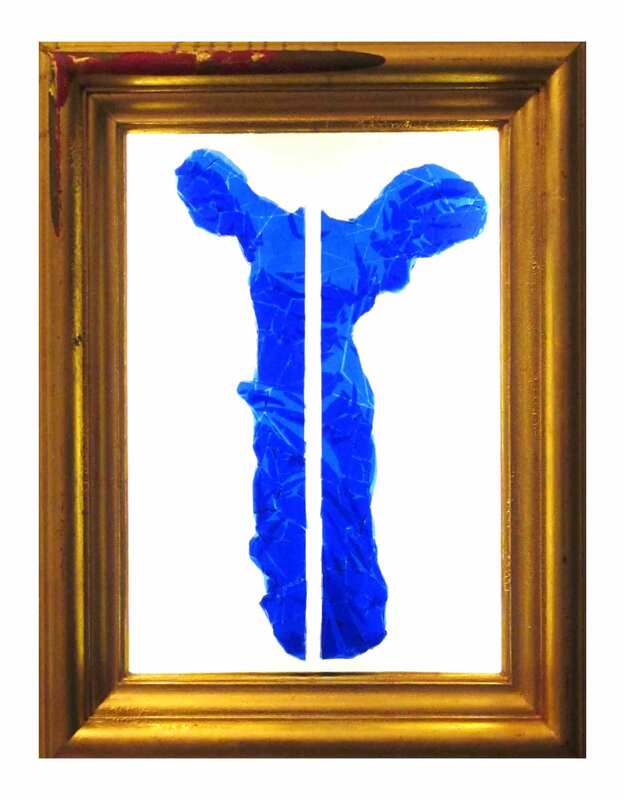 Created with clear resin and stained glass to emulate Yves Klein’s famous monochrome blue, ‘La Victoire” is placed and enlighted within a hand made golden leaves frame, with the wood originating from a disappearing church.